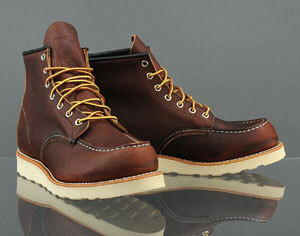 Leather work boots are known for their durability and protection. 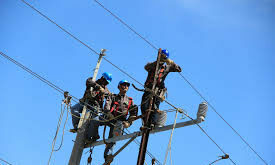 They’re vital pieces of gear in a number of different industrial settings ranging from construction zones to warehouses. These heavy-duty books can last for many years with proper care and are a worthy investment. With that being said, work boots have to be broken in to be comfortable. 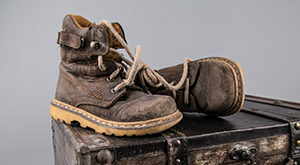 Whether they’re steel-toe or made from finished leather, brand new shoes straight from the manufacturer can be very uncomfortable because they haven’t conformed to the foot yet. This leads to pinching in the toes and painful chaffing. 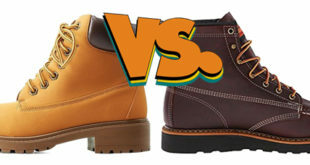 To make new leather work boots more comfortable, here are some effective ways to break them in. One of the easiest and cheapest methods is to simply wear them around the house for a few hours every day. It should be noted that work shoes should be purchased well in advance for the break-in period. During this time, the shoes can be worn for a few hours every day with thick or multiple layers of socks. This will stretch the fibers in the problem areas, such as the toe. This is especially effective with steel-toe boots. A few hours each day will give the boots enough time to conform to your toes while allowing you to get used to the feeling of the steel. If flexibility is an issue, you can bend the body of the boot back and forth before placing them on each day. The sole will become more flexible with time. This method fixes specific problem areas. It’s commonly used to prevent pinching of certain toes. It requires the use of a large stick or a shoe stretcher. Shoe stretchers can be purchased fairly easily and help to loosen fibers. Simply place the stretcher into the boot and extend it so that it has a tight fit. A large stick, such as a handle from a broom, provides more precision. Place the tip of the stick at the point that pinches. 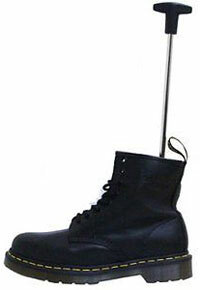 Then bend the boot over the stick to stretch the particular point. * You should be able to see a slight protrusion in the leather. Warm water is a great way to loosen the fibers of the leather. It’s used by military members to get that perfect comfortable fit. Simply soak the shoes in a bucket of warm water for approximately 30 minutes depending on the leather. Finished leather may take longer to fully soak. It’s important to monitor the boots during this process. Too much soaking can lead to permanent warping and damage. After soaking, remove the boots and excess water. Then slip them on with socks and wear them for up to an hour. During this time, the fibers will mold to the shape of your foot for a precise fit. They will dry up a bit as you wear them. When fully dried, the molded shape will stay. This method aims to stretch the leather using frozen water. This should be completed on fully waterproof boots and under a watchful eye. Depending on the quality of the leather, the shoe may become damaged if not careful. Simply fill up a plastic bag with water and remove the excess air before sealing closed. Place the bag of water into the boot, positioning it where the boots pinch. Then, place the boots in a freezer. As the water freezes into ice, it expands and pushes the leather outward. Once it’s completely frozen, let the ice thaw out before removing the bag. The boots should fit better and more comfortably. If you have some lotion or hair conditionair lying around, you can use them on the boots to soften the fibers. It’s an incredibly cheap and effective method that is used by many men. All it takes is a bit of moisturizer on the uppers. The moisturizer should be applied evenly over the problem areas and left to dry. It’s best to let them air dry so that the moisturizer has time to soak in slowly. After the moisturizer has soaked in, put the boots on and wear them around the house for a few hours. The softened fibers will slowly mold to the shape of your foot. The process can be repeated and even used in combination with the stick method or shoe stretchers. Similar to the previous moisturizing method, an oil leather conditioning treatment aims to make the leather fibers more malleable. The main difference is the product used and the application. Oil leather conditioner is made specifically for breaking in new shoes and maintaining them for continued durability. Alternatively, Mink oil can be used. With this method, a thick coating of the conditioning oil is applied to the entire upper section or a specific spot that is causing trouble. This oil should be left overnight to soak into the leather fibers. The next day, simply wipe away any excess oil that didn’t soak into the leather and slip them on. The area in which the oil was applied should be more pliable and comfortable. Heat will loosen the fibers of the leather and make it much more flexible. It’s a fast option that can do wonders if you’re pressed for time. 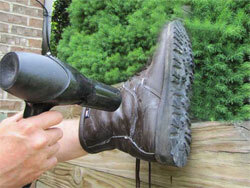 With the boots on, simply use a hair dryer to apply heat to a problem area. The dryer can be pointed at a specific area that pinches to loosen it up and cause the leather to conform very quickly. 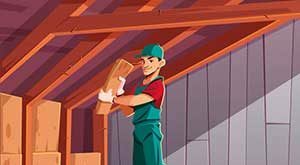 It’s important to exercise caution with this method to ensure that excessive heat doesn’t cause any issues. A simple hair dryer is a safe method that doesn’t produce a ton of heat and provides precise aiming. It can also be used with moisturizers for quick results. If you’re in a pinch for time, insoles are great for molding new work boots and making them comfortable to wear. A large variety of insoles are available on the market today ranging from thick gel to thin padding. 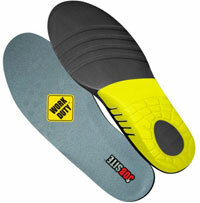 Just choose an insole that works for you and is designed to fit into work boots. The insole will make wearing the boots more bearable and promote flexibility in the sole. This extra cushioning on sole makes it conform better to your foot over time. Set aside as much time as possible for the break in period. Use various methods to break boots in gradually for the best results. Use moleskins to protect the feet from chaffing on problem areas while breaking in. Always try on boots before buying. Use thick socks when trying them on for a bit of extra room. 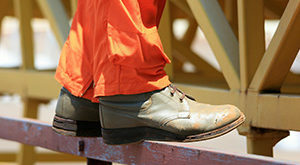 These methods can help you break in new work boots for a comfortable and safe fit. While some methods are more effective than others, it’s all about finding an option that works with your needs and the particular materials in the boot. Of course, it’s good to be cautious to avoid damage. After the break in period, boots will be safe to use for many years to come.